Even though I am only allowed to have an electric grill here at our condo, I still try to do some grilling outdoors when I can. This past weekend was so hot I just couldn’t bring myself to turn the oven on and cook and this week does not promise to be much better. I want to try to grill at least twice a week during the summer to try some new grilling recipes out, and yesterday was the perfect day to start. 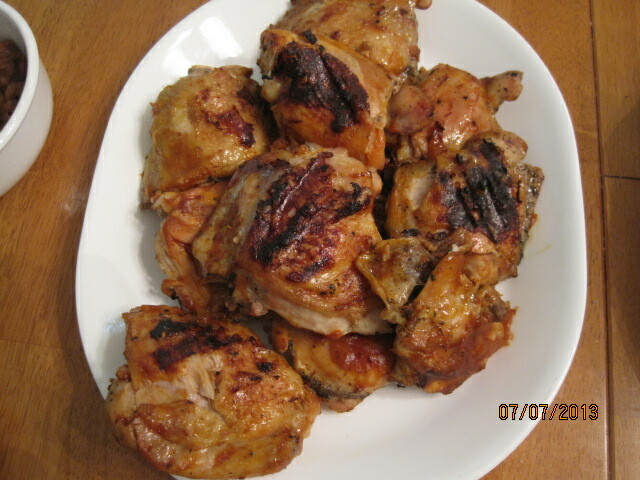 I had picked up some chicken thighs and the store on Saturday and decided to barbecue them. I found this recipe from Williams-Sonoma that looked good, but I also wanted to try out a barbecue sauce recipe I had picked up from Food Republic, so I combined the two to make last night’s dinner. To make the brine, in a large bowl, combine the water, salt, basil. coriander seeds, peppercorns, mustard seeds, garlic and bay leaves and stir until the salt dissolves. Use immediately. At least 30 minutes before you plan to begin grilling, remove the chicken from the refrigerator and remove the pieces from the brine. Discard the brine. Rinse the chicken pieces briefly in cold water and pat dry with paper towels. Lightly sprinkle the chicken on all sides with pepper and garlic. Prepare a grill for indirect grilling over medium heat; the internal grill temperature should be about 350 degrees. If you are using charcoal, bank the lit coals on either side of the grill bed, leaving a strip in the center without heat, and place a drip pan in the center. If you are using gas, preheat the burners, then turn off 1 or more burners to create a cooler zone. Brush and oil the grill grate. Place the chicken pieces on the grill over the direct-heat area and sear, turning once, for 2 minutes per side. Move the chicken pieces to the indirect-heat area, cover the grill and cook for 30 minutes. Now, start brushing the chicken with the barbecue sauce, turning and brushing the pieces every 5 minutes, for about 15 minutes more. The chicken is ready when it is firm to the touch and the juices run clear when a thigh or breast is pierced with a knife tip. Transfer the chicken pieces to a platter and serve immediately with the remaining sauce on the side. Of course, you don’t have to brine the chicken if you don’t have the time or don’t want to do that, but I think it makes a big difference in the flavor. The brine infuses the chicken with some extra flavor and plumps the chicken up, helping it to make it juicier. You do need to watch the chicken closely on the grill as the fat tends to cause flare-ups, which can cause you to burn the chicken before it is cooked all the way. Using the indirect heating method with a drip pan can really help you with this and the chicken in this recipe turned out perfectly. The sauce was a great find and really added nicely to the chicken. I was intrigued as soon as I saw this recipe and knew I was going to make it. Heat the oil in a medium saucepan over medium heat. Add the onion and saute, stirring frequently, until the onions are translucent, about 5 minutes. Deglaze the pan with the whiskey, stirring to scrape off any bits from the bottom of the pot, then add the rest of the ingredients and whisk together. Bring the mixture to a simmer, then reduce the heat to low and cook for 20 minutes. Remove the sauce from the heat, allow it to come to room temperature and transfer it to a container with a tight lid. It will keep in the refrigerator for up to 1 week. The combination of the whiskey, liquid smoke and hot sauce is perfect. It was not too thick or too sweet and had an awesome flavor. i could see using this on ribs, chicken or pork without any trouble at all. I served some on the side so people could extra to their meal if they wanted to. That’s all I have for today. Check back next time to see what recipes come up as I am trying out some new things this week. Until then, enjoy the rest of your day and enjoy your meal!